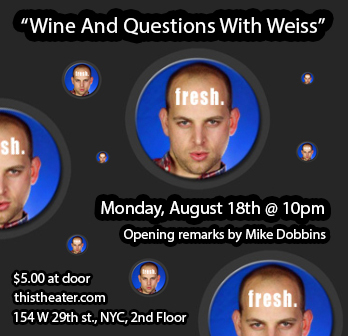 From time to time I do my one man show, “Wine And Questions With Weiss” where I do a whole set of nothing but take questions. Zero material. 1. Ask a question about anything he/she wishes and The Weiss will provide the answer. 2. Ask advice on anything in his/her life and The Weiss will provide a solution. 3. Heckle The Weiss and he/she can go mono-e-mono with The Weiss. Head-to-head. 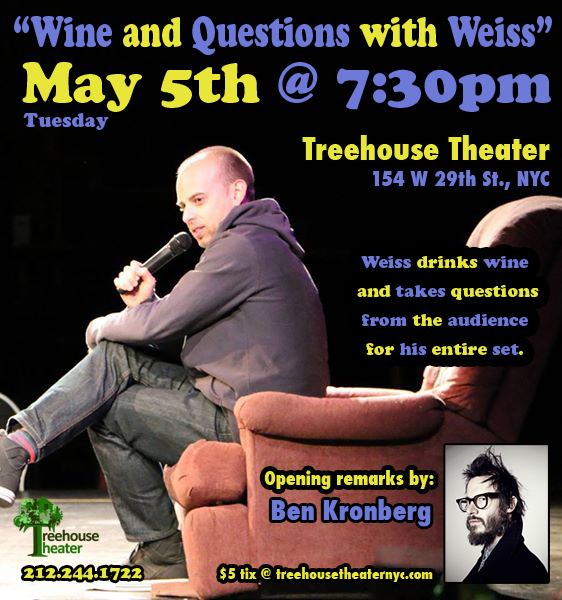 But be prepared, The Weiss has been doing standup for over 10 years and is as quick as they come, especially with wine in his system. 4. Give The Weiss a compliment of your choosing.